If you’re serious about attaining your goals, you must act like it. Just like a dog who’s so laser focused on chewing his bone that a passing squirrel wouldn’t faze him, you must be so laser focused on your goals that you tune out all the noise. Every action you take needs to align with your goals – the books you read, the clients you accept, the ads you promote, the conferences you attend, and the contracts you sign. Anything that doesn’t align with your goals is noise. Fight for your success by saying no to opportunities that don’t align with your goals, eliminating ones you’re engaging in that are keeping you farther from success, and making sacrifices as needed. That may mean less social nights out, tabling some great ideas for another time, or eating out less so you can put more money into growing your business. Whatever that looks like for you, there’s no better time than now to take action. Creating a strategic plan 90 days out is vitally important for your business but it shouldn’t be set in stone. At the end of each quarter, review the strategic plan you implemented. If it was not effective, adjust your tactics. Strategic plans are not flawless because new information is gained all the time, some of which could produce a better outcome. You don’t know what obstacle or opportunity could land in your path and totally derail you or launch your success. It’s important to be flexible. Don’t become so rooted in your plan that you refuse to acknowledge advancements in technology, the loss of key employees, new market trends, or a quickly changing economy. What matters is the end result. Review your plan at the end of each quarter and make course corrections as necessary to tackle unforeseen obstacles, address new information, and ensure you achieve desired results. As the CEO of your company, you need to know which activities must be executed by you. Otherwise you can’t be productive and lead effectively. Productivity is simply investing your BEST time into your BEST activities. Too many entrepreneurs get permanently stuck in the mud of checking emails, accounting, purchasing supplies, and social media which consumes their best time, depletes their energy, and leaves them overwhelmed. If your goals are vague, you’ll end up working on tons of things that will lead you nowhere, just like running on an elliptical. You’re working really hard but you’re not getting anywhere. You’re not progressing toward your goals because you’re spread too thin and wearing out. Have clarity on your goals and on who needs to do what to achieve those goals so you can take purposeful and fruitful action. Your mindset is like a flower that needs constant TLC. Even if you have a positive mindset, it can change in a heartbeat, wilt, and die if you don’t nurture it. If you’re not proactively maintaining your growth mindset, one negative review, one pissed-off client, one failed deal, or one technical difficulty could seriously screw with your head. And when your head is not in a good place, your confidence lacks. Your willpower lacks. Your focus lacks. Your passion lacks. A fixed mindset makes it difficult to make smart decisions to grow your business. Daily affirmations to the mind are like exercises to the body and both must be kept healthy. Say daily affirmations to build yourself up and empower yourself to do what is needed to achieve success. If you don’t take time to appreciate where you’re at compared to where you’ve been, you won’t be motivated long enough to stay the course and achieve your bigger goals. Start celebrating your wins, even the small ones. Doing so will make you feel good about your progress, help you stay motivated, and encourage you to reach your next milestone. Celebrating doesn’t have to be a big or costly ideal. Enjoy a piece of candy, coffee, small gift to yourself, movie, massage, trash tv, dinner at your favorite restaurant, or even just give a “Nice work!” to yourself. What’s more important than the reward itself, is simply acknowledging your efforts have given you reason for one. If you constantly put your business, everything, and everyone else first, you’re risking burnout. At the very least, you’re risking feeling physically exhausted, sick, overwhelmed, or totally discouraged. Take care of your own needs in addition to your clients’, business’, and family’s needs, otherwise your body will eventually force you to and let me tell you, hospital beds are expensive! Get seven to nine hours of sleep each night. Eat healthy foods that provide energy and the nutrients your body needs to function at its best. Take breaks to refresh. Take vacations to recover and rejuvenate. Take time for yourself whether it’s a spa day, painting class, romance novel, sport, or dining at the new it restaurant. Entrepreneurs have the tendency to think every dollar that comes in has to go back into building their business. The problem with that thinking is in building a great business, you could also be building a life you don’t want to be living. Self-care is essential to your long-term success. When you declare a fresh start, you’re doing so from a place of optimism and the feeling that you can conquer the world. That’s wonderful but I warn you to be careful about saying yes to everything. It’s the easiest way to derail your success. Say no to others’ requests of your time if it doesn’t align with your goals or where you are currently in your business. Perhaps that partnership would serve you well but maybe this month isn’t the nest time to add it to your plate. Say no to yourself. Sure, you love your Thursday nights out with your friends but they’re making you show up late and exhausted in your business each Friday. If you don’t want to eliminate them entirely, show some discipline and start peacing out an hour or two earlier. For activities that no longer serve you but have simply become routine, eliminate them. Also, delegate tasks that can be taught and don’t need to be done by you to make your task load more manageable. Be incredibly proactive and intentional with the people you let in your life. Professionally, that means your employees, team, colleagues, and peers. If you have people on your team that are not amazing, motivating, and help you achieve your goals, you need to look at realigning who’s on your team. You could be one hire away from a total, positive transformation in your business. You could also be one delayed-firing away from an employee sinking your ship because they keep drilling holes in it. Personally, surround yourself with supporters of you, who lift you up and encourage your success. That means don’t allow partners, friends, and family who don’t believe in you or want to limit your success to their own into your inner circle. You can’t choose your family but you can choose how much time you spend with each member of it. Having a Word Of The Year helps you put that goal front and center in your life. It helps you stay laser focused on it and take intentional action toward achieving your goal throughout the year. Filter groups, communities, projects, affiliations, meetings, partnerships, programs, ideas, and any shiny object that comes across your path against your Word Of The Year. If it doesn’t align, consider if you should table it or if you should simply swipe left and forget about it. Sometimes entrepreneurship can feel like you’re taking two steps forward and one step back or even one step forward and four steps back. Don’t let small defeats knock you off track and screw your mindset, making you think you’re not capable of success. You can have a bad day but don’t let that bad day roll into the next day and the next day. If you’re behind on reaching your goal and feel like it’s going sideways, readjust your train, not your tracks. The feeling of having a fresh start is really your mindset around it. Don’t tell yourself you’ll start again fresh next week or next month. You’ll continue negotiating with yourself and pushing your fresh start off. Embrace the truth that EVERY day can be a fresh start, not just the beginning of a new year. You just have to make that choice. 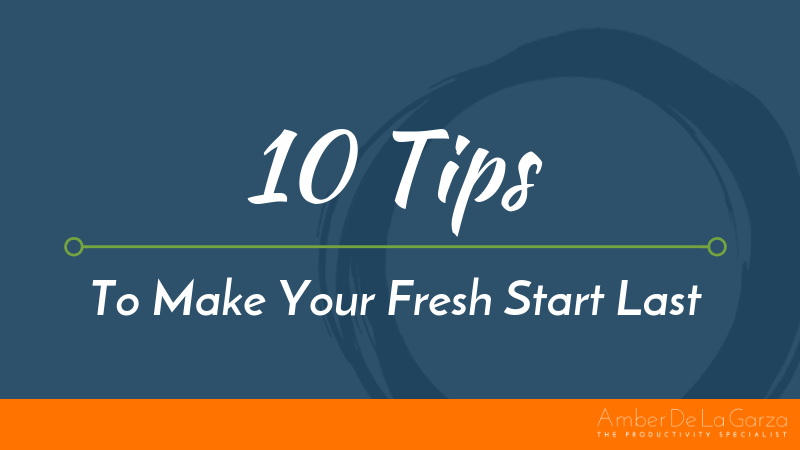 It’s easy to make a fresh start, especially when everyone around you is vowing to make their own fresh start in the new year. The challenge lies in making your fresh start last so you don’t fall off course and wind up right back where you were at the end of the previous year, drowning in uncompleted projects, unfinished tasks, and unachieved goals. Make this year different. Grab the reigns, stay on track, get back up when you fall down, and make your fresh start last through 2019 and beyond.